College spokesperson Diana Lawrence denied any involvement by the College in the scandal in an email statement to The Dartmouth. However, she said that precautions would be taken to prevent any such scandal in the future. 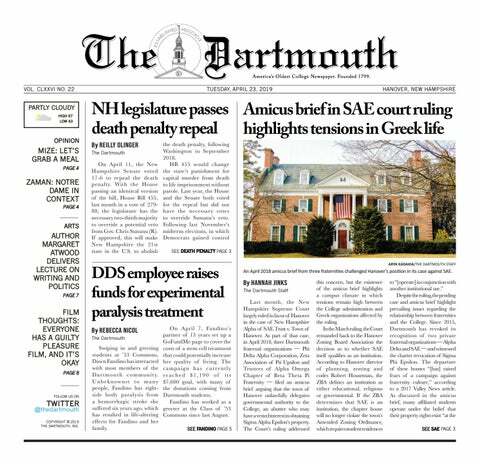 Although the FBI did not name Dartmouth in its investigation, an online biography of Mark Riddell — who has been charged with conspiracy to commit mail fraud and money laundering — said that he assisted students in gaining admission to a number of universities including the College. Law enforcement officials have accused Riddell of tweaking clients’ standardized test answers to improve their scores while he worked as the director of college entrance exam preparation at IMG Academy, a Florida private school. Riddell’s page on the account’s website has since been deleted. However, to date, there is no evidence that Riddell used illegitimate means to provide this assistance. Lawrence added that the College has not been contacted by the Justice Department in relation to the matter. Vice provost for enrollment and dean of admissions and financial aid Lee Coffin said that he was disappointed, but not surprised, by the national college admissions scandal. He added that the highly competitive nature of college admissions may have motivated people to lie and cheat. “It’s this idea of impossibility that I think is the wind in the sail of that scandal,” he said. Although IMG Academy’s website stated that Riddell helped students gain admission into Dartmouth, Coffin said he doubts that any wrongdoing could have been possible. Coffin said he is proud that the College was not involved in the scandal but is disappointed that the admissions process may need to be more critical in the future. “I have not historically had to read every file and be suspicious of the material that’s been submitted,” he said. However, he added that some files stand out when “something smells” about their authenticity. Alison Ingalls, a recently admitted member of the Class of 2023, commented on the scandal from an applicant’s perspective. Ingalls added that she has felt better since hearing that Dartmouth was not involved in the scandal.